This historical mystery novel may interest young readers who crave insights into the past. The KingBee by George S. Haines is an old-fashioned young adult detective story with a historical flavor. The fifth title in its series, The KingBee resumes the story of Sam and Howie of the S and H Detective Agency. A new mystery awaits them in Grant County, Indiana, involving a bank robbery, a coal mine, and German scientists. It’s 1948, and the young detectives, fresh off of their last case, have a thriving agency. When they take up the case of a bank robbery, they discover an experimental lab in an old coal mine that could endanger the mysterious man known as KingBee. Action and adventure await. The plot is very straightforward. Howie, Sam, and the residents of Grant County form an almost Mayberry-like community. Sam and Howie each have steady girls, life meanders along, and there are very pointed references to “Southern courtesy.” Even with accidents and occasional bumbling, the bad guys pay the price at the end. For teen readers who are searching for less violence or to escape the trappings of contemporary society, this gentle setting may work well. Even though this is the fifth book in the series, the characters of Sam and Howie are well developed in this installment, so their actions and motives always make sense. A short prologue details how the boys have matured and changed, and a detailed list of characters will help readers jump right in with this book. The presentation of The KingBee is somewhat off-putting. 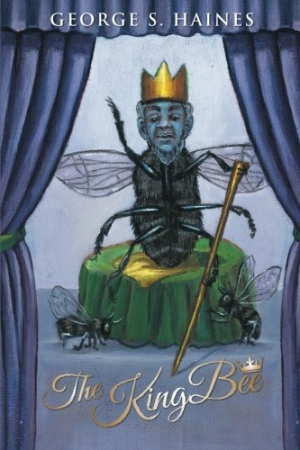 Its cover features a grainy bee with a human head, an image with almost juvenile strangeness that ultimately does not seem to connect to the internal story. Still, the book fills an interesting niche for young adults. The entire series takes place in the 1940s, and there are many references to that time period, such as drive-in movies and lingering feelings after World War II about the Germans. The setting helps to solidify this book as a decent historical novel, and the central mystery will keep young people reading. George Haines’s The KingBee is a strong historical mystery novel for young adult readers, especially those interested in the time period right after World War II.